Galen's works represent one of the most impressive monuments of Classical medicine. They dominated medical theory, teaching and practice in the medieval European and Islamic worlds and remained a key source of medical wisdom down to the twentieth century. But his works also concern themselves with all the philosophical issues involved in understanding the human body, soul and health, and in diagnosing and treating illness, and Plato and Aristotle were key influences on his thought. Furthermore, as the court physician of several Roman emperors, Galen is an important source of information about social and cultural life in the early Empire. Cambridge Galen Translations provides a co-ordinated series of scholarly English translations of works of Galen in a unified format with substantial introduction and annotation, glossaries and indices. Many of the translations have been newly commissioned, while others are revised versions of good translations which have for some time been out of print. 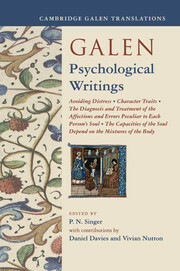 Editors and translators are drawn from the world's leading scholars of Galen and of ancient medicine. 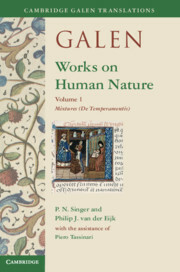 The series is intended both to contribute to international Galenic scholarship and to make Galen's work more easily accessible for a wider, non-specialist readership including historians and philosophers of science and readers with a medical background. Receive email alerts on new books, offers and news in Cambridge Galen Translations.